Fresh off his critically acclaimed performance in Arthur Miller’s The Crucible and just before he’s about to embark on a worldwide press tour for Peter Jackson‘s highly anticipated, The Hobbit: The Battle of the Five Armies, Richard Armitage has decided not to sit around sipping tea and reading books, but instead has signed on to star in the indie psychological thriller, “Sleepwalker” to be directed by Elliott Lester. Let no moss grow under this man’s feet! Joining Armitage will be Screen Actors Guild Award winner, Ahna O’Reilly who gave us the heartbreaking and unforgettable performance as Elizabeth Leefolt in Tate Taylor‘s The Help. Dr. White character is described as handsome, open and honest (Gee, I wonder how they thought of Armitage?) He’s the senior M.D. at the sleep research center where Sarah comes for treatment. A unique relationship forms between them but the film promises such shocking twists and turns…that nobody will see them coming! It sounds absolutely thrilling and incredibly intense to me. But for Armitage, who just spent the last several months delivering the most captivatingly gut-wrenching performance as John Proctor at The Old Vic Theatre in London….Dr. White might be a walk in the park for him. No release date has been set as of yet but the Armitage Army need not fret as Richard will soon grace the screens for one last time as Thorin Oakenshield when the final Hobbit movie opens nationwide on December 17th, 2014 (bring you tissues!) And, there is still the promise of The Crucible, currently in post production, to be released by Digital Theatre…not to mention his recently wrapped film, Urban and the Shed Crew directed by Candida Brady. So there shall be plenty of Armitage to go around for everyone…and just in time for Christmas too! Lady Anglophile…searching for sleep research lab with handsome doctor attached. 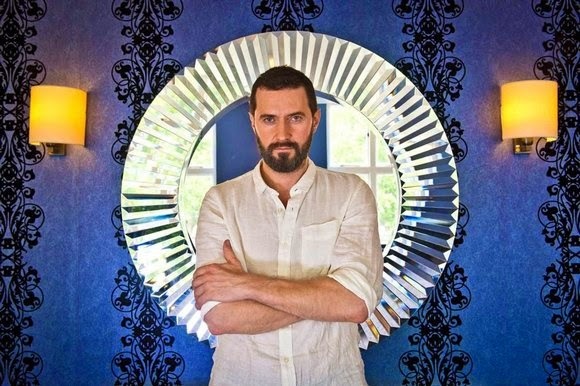 This entry was posted in Armitage Alerts!, Home Page Posts and tagged Richard Armitage, The Hobbit. Bookmark the permalink. This sounds like my kind of movie!! And I so can’t wait for The Hobbit: BOTFA!! I’ll be sure to have a big box of tissues and drown myself in soda and chocolates!! Thank you so much for the film synopsis!! The RA fandom has been wondering what the story line is. Thanks for the info! I think you’re the first to have some details on this project. The plot sounds very interesting; it will be great to see Richard in a contemporary setting! Sounds like it has a lot of potential! (Anything with RA automatically does, but this really sounds intriguing!) RA as a doctor… means he’s probably going to be an intellectual… Mmmm! Any idea if he’s a British doctor in the film? Or will he have another American accent? Great information! Thanks for the details – sounds really interesting! Finally: real intel on Sleepwalker! THANKS, The Anglophile Channel!!!!! Thanks for sharing the very first detail about the movie. Plot sounds intriguing. Jetzt ist es ganz offiziell,Richard Armitage in Sleepwalker, veröffentlicht vom Anglophile Channel….. Sounds interesting. Thank you for sharing. As a fellow SoCal native, I wouldn’t recommend him going to Shutters or the Ivy: both locations are riddled with the those pesky paparazzi! incredible actor & I look forward to any & all his future performances. Glad I found your site, thanks for the preview! Thanks for the info on the film. Sounds interesting and I’m betting that the doctor isn’t quite what he seems but that is part of the twists and turns. He was here in time for the heat wave and now it will cool a bit so I’m sure he’ll like that. I’m sure he will find places to frequent that don’t have a lot of paparazzi but they’ve left him alone before and probably will continue to do so. This is a man who knows how to relax and still keep his privacy. Yes, that is why he chose this psychological film. He has an interest in this sort of scary and twisted plotline. He doesn’t like horror films so this stops short of that and is probably what could be considered an intelligent mystery. If that photo was how he looks starting the film it would appear that the beard is staying for the moment too. Thanks Marlise for this great description of the film! Not my kind but will watch it for sure! Dr. White, I’m having trouble sleeping, too. Do you make house calls? Maybe you wouldn’t want him to…just maybe?…Not as Mr White, anyway 🙂 Let’s see. Interesting plot. By the sound of it, this film has even more interesting elements to it. I can’t wait! I hope Richard was kind to himself, and gave himself one week to (somewhat) physically recover from Proctor. Richard is an amazing actor, but, due to the timing/rapid turnaround, it will be interesting to see if – even subliminally – small aspects of Proctor bleed into his Dr. White. I’m not refuting his professionalism. Merely pondering. Thanks, Folks! First thought I had as well when I heard about the plotline. However it doesn’t appear that he is the one with the issues as far as sleeping and reality. it is a twisted line apparently so we’ll all have to wait and see if he is the good guy or the bad guy here. с потом вы можете написать если не это сложным писать.